Pultrusion products ... set to rise in demand. Pultron Composites, which produces high-performance glass fibre-reinforced polymer (GFRP) pultrusions, sees good prospects for growth in the region where large infrastructure projects such as metro and rail projects are under construction. The company was recently part of an 18-member New Zealand business delegation that visited the UAE, Saudi Arabia, and Kuwait together with the New Zealand Prime Minister John Key. The mission (from April 26 to May 1) met with several key government and business leaders that have the potential to influence the use of its products. New Zealand-based Pultron Composites, with offices and manufacturing facility in Jebel Ali Free Zone to serve the regional market, is a global industrial technology company involved in the research, development and manufacturing of high-performance GFRP pultrusions that are post-processed to specific customer requirements. The company was established in 1982 in New Zealand and set up its Jebel Ali office in 2005. “We have a reputation for solving technically challenging problems where bespoke GFRP pultrusion solutions are required,” says Rob Fordyce, general manager, Pultron Composites. 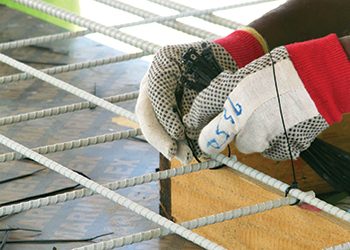 MateenBar is Pultron’s proprietary high-performance GFRP reinforcement rod for concrete structures. Other products offered by the company include structural pultruded profiles and bespoke pultruded sections. The company recently introduced the second generation MateenBar, with improved tensile strength (more than 1,000 MPa) and modulus (more than 60 GPA). Earlier it had introduced MateenBend, a high-strength and cost-effective GFRP rebar bend. “Bespoke shapes can be rapidly developed with high volumes, including standard bend and stirrup sections, and continuous helix shapes including rings for piles. We are the first in the world to transfer the bent bar making technology to the GCC market – which solves a major problem for the industry in that bent bar GFRP reinforcement is now available locally with very short lead times,” says Fordyce. Describing the MateenBar, he says: “The name Mateen – an Arabic word which means strong and durable – was chosen because of Pultron’s commitment and investment in a Jebel Ali production facility to cater to the harsh environment, and large infrastructure projects in the GCC market. He continues: “It is highly resistant to chemical attack and corrosion, which makes it ideal for marine applications, chemical plants and other environments where steel is unsuitable. As it is non-conductive, stray electric currents cannot cause induction problems. Thus it is useful in areas of high electrical fields, where significant power is lost due to induction into the surrounding steel reinforcement. The company has implemented more than 200 MateenBar projects worldwide, and 100 significant projects in the GCC region since 2003. These include Lusail Expressway, Doha Metro Green Line and Um Ghuwalina Station in Qatar; and Gasco at Zirku Island and Adco substations in Abu Dhabi, UAE. The company is looking at further expanding production capacity and staff in Jebel Ali and New Zealand around Q4 2015. It is also looking at implementing the MateenBolt technology from New Zealand to expand and complement the soil engineering offerings in the GCC markets. “We also want to increase focus on developing the MateenBar market, our online and digital marketing presence and on capital investment/strategic partnerships to boost our rate of growth,” says Fordyce. He also anticipates growth in the marine and corrosion-related applications as more consultants discover the engineering benefits of a non-rusting rebar. “Owners and governments are discovering the significant economic benefits that can be derived from extending a structure’s lifetime. A focus on whole of life costing as opposed to upfront costs will see a growth in composites to overcome traditional material limitations,” he concludes.